CenterSOLUTIONS for the Common Core Review and Giveaway! - The Resourceful Room! Carson Dellosa has a brand new line of products that I am excited to share with you!! 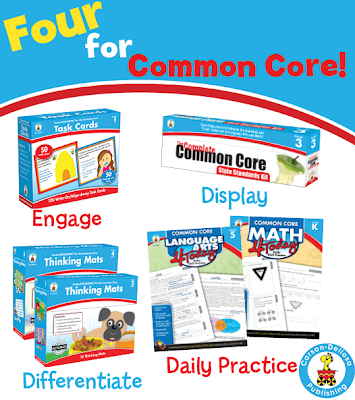 Check out the Common Core activities they've created! I am so excited to be using a couple of these products next year! I have been looking for some fun activities for one or two students at a time to work on while I am helping others. I need something they could grab quickly and practice until I get to them. These new products fit the bill perfectly! So many of the things I find are too difficult for those with disabilities to use on their own, and when I try to move down a level they get very "little kid" fast! These are simple yet age appropriate and best of all they take almost no prep on my part! They have the standards written on them so all I have to do is find the one the coordinates with what we are learning and give it to them! Here are the two products I got for my students. I love these because while they are fun, they require the kids to "think"!! Each set includes 15 write-on/wipe-away mats with coordinating game cards. The cards and the mats are color coded for easy organization and cleanup. The mats can be used individually or with partners and are open-ended to be used again and again. A 16-page resource guide with recording sheets is also included to allow students to explain their work in the context of the Common Core Standards for Mathematical Practice. I can't wait to use these with my students next year! They are perfect for review practice. I think my students will enjoy them and they will be so easy for me to align with lessons because they have the standards on them! See more in this video! Most of you are probably familiar with task cards! These cards have a short activity on them that is done independently and many times recorded on a recording sheet. I love these because the students can write on them and erase when they are finished, and you have an option to go online and print recording sheets if you want them to turn their work in!! The activities are great, I know my students are going to be challenged to think critically by these. They are going to make a great center option next year!! The set contains 50 language arts cards and 50 math cards, each printed with a standard on one side for easy planning and progress tracking. A free online resource guide provides a standards matrix, recording sheets, and an answer key. Now here's the chance for you to win a set for your classroom too! 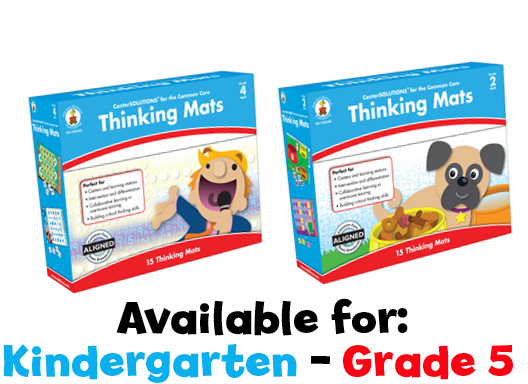 Three winners will be chosen to receive a set of Thinking Mats and Task Cards for the grade level of their choice! How Awesome IS That!! All you have to do is enter using the Rafflecopter below. Winners will be chosen after midnight on the 20th and announced on the 21st! Good Luck Everyone! Thanks so much for reading my blog!! I would love to win a first grade set! I teach 5th grade so I would love to win the 5th grade set! I would love the 2nd grade set! Oh that would be so great to win!! Thank you for blogging about these! 4th grade set would be an amazing addition to my classroom! Thanks! I teach 3rd grade Inclusion; would love a 2nd or 3rd grade set! I teach 1-6 special ed. I would like a primary level (preferably grade 1) set. 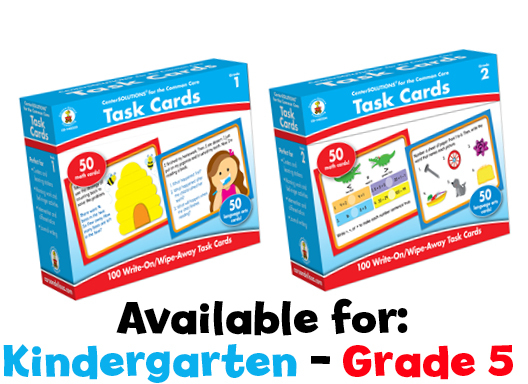 kindergarten please :o) great giveaway!!! Since I'm moving up, my classroom would really benefit from 5th grade! Thanks! This looks so great! Thanks for sharing & for the give a way! I teach 4th grade. Thanks for this opportunity. I teach 1st grade so I would like a set that would be beneficial to my students. This looks awesome! I teach first grade, so I would like the first grade set! I'm glad I got to "see" the sets! I have them on my wish list for my students. I would love a third grade set. Thank you for sharing these great ideas! I would love to have the Thinking Mats for my first graders. I love this! I would pick Kindergarten. I would love to use these in my classroom next year! I teach 2nd grade. I teach k-2, I would take any grade available. I would love 1st grade...this stuff looks great!! I would love 1st grade. Love to win this product for my 1st grade. Thanks for the giveaway! I would love to win a set for my kindergarten class. I would love a first grade set! What a great giveaway! I would love to win a 4th grade set! I would like a 2nd grade set please. If I am chosen I would like a second grade set please. Love the giveaway! Kindergarten set please. So excited to see this! Would be a wonderful asset in my classroom! Can't wait to see if I win. This looks awesome. My 2nd graders would love them. I like these. I think I would like 3rd grade. Going to have to think about this and check into it. I get to order a bunch of stuff at the beginning of the year...this will be on my maybe list. These products would be an incredible addition to my resource room in NYC. 5th grade please! Nice giveaway! I'd love the 1st grade set! I would love these resources for 2nd grade. I would love these resources for kinergarten! I am moving from 6 years of 2nd grade to Kindergarten!!!! I would like to win the 5th grade set. Nice Blog... love the font and graphics!! I saw these products for the first time last night on the giveaway and I am very excited about them. My state is not common core, however, my school system uses NWEA MAP testing to assess student growth and evaluate teachers.. MAP is based on common core... my students have not shown the growth in MAP but do great on our state standards. My evaluation is tied to this testing.. When I saw these products last night I thought this would be the key to really help me out and connect the common core to our state standards and help my children do better on the testing and in turn hopefully help my evaluation. It is so frustrating to to be evaluated on a curriculum we do not teach... yet the higher ups do not seem to understand that. My state standard testing results are always very good... so I am doing something right after 23 years! Thanks for offering the give away. As you well know, we teachers have no money and my school system has no money to buy resources for us. PS- I teach 2nd grade so would love that set! Thanks! I love that Carson Dellosa creates products that are useful and do not require a lot of prep time or explanation. I would love to have these for my first graders! I love these! I saw them as part of pennilessteacher blog last night. I would love a set for 5th grade. Thanks! WOW What a fab giveaway! I'd love to use these in my 3rd Grade classroom! I would love this for my 3rd graders! Thanks for the opportunity! Entering under FB name (Danny Taylor Rhonda). Would love a set for second grade! I would like the 3rd grade. This would be great for 3rd grade. Thank you for this opportunity! Thee materials look fantastic! I would need the set(s) for third grade. Thanks! Wow, what a fantastic giveaway! I would love the 3rd grade materials for my special needs class! 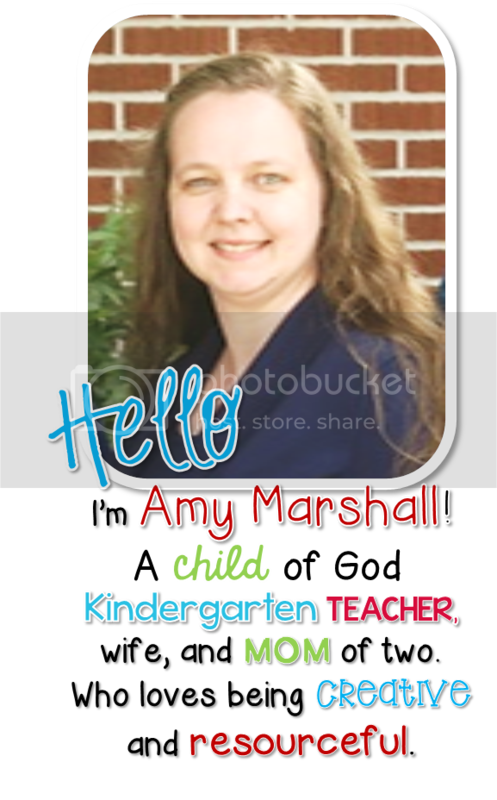 I am a Special Education teacher in a building with grades 2-5 so any grade would be great. I would probably choose grades 2 or 4 since I don't have as many resources at those grades. Thanks for the chance to win! I would like 4th grade. Thank you! Would LOVE LOVE LOVE to have a 1st grade set! Thank you. I teach grades 1-5 so I can't be picky! I'll take any grade level! Thanks, love this giveaway! I'm a special needs teacher too! I'd love the 2nd grade set if I won! This stuff looks awesome! I would love a 2nd grade set if I won! What a great resource. I am always looking for ideas and activities for my kindergartners!! Great post with videos!! THANK YOU! I would love the Kindergarten set! I would love the 2nd grade set. Thanks for sharing all freebies for next year! I might just have to change my classroom them. I would like a 1st grade set. Just found out I will be teaching 4th next year, so this would be wonderful! I would love third grade! I would love to have one for 2nd grade. This is very much needed in poor urban schools. We do not get materials needed to meet the standards. Would love these for my 4th grade kiddos! I'm an ELL teacher and am always looking for new ways to reach students just beginning their journey in American schools! I'd choose the 2nd grade set. Thank you! These sound like such an awesome activity for that be used with all my kiddos! The second grade set would be great! I would love to win either the 3rd or 4th grade set for my self-contained ASD classroom! I have been looking into using these with my first graders. I would love it! I would love a second grade set! Thanks for a chance to win one! These look great for my 5th graders! I am working with my grandson and he is very hard to motivate. These Task Mats would really capture his interest. I would need the first grade set. These would be perfect for my First Grade Classroom! I would love to win a set for my 3rd graders! It is so tough to have to buy resources for my classroom in this economy, and this set would be so great for my students! I would like a 5th grade set please.